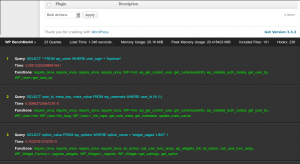 WP BenchmrkII is a tool that I made for profiling, benchmarking and development. It has many key features that can significantly help with these tasks. This tool is in development itself, but I use it almost daily for my work. Its very powerful and helps me greatly in my day 2 day WordPress work. Currently some of the biggest issues I am asked from WordPress clients are about performance. I use this tool to locate and remove performance bottlenecks. 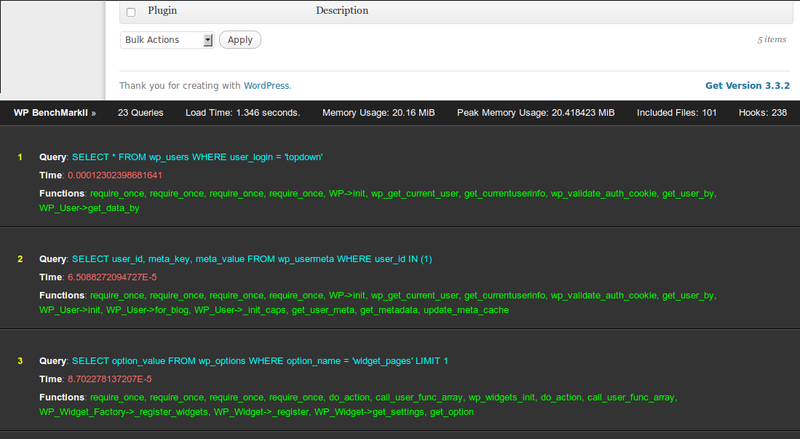 I also use it when developing client sites in WordPress so that I can keep track of how my code performs. This way if something goes high, like memory after adding the code, I know it needs refactoring. This plugin is Open Source and can be downloaded from my GitHub account. Get the code here. If you use it, you should follow this project, I change it adding new features constantly. Rename the parent folder to WP-Benchmark after unzipping. LIke I said, this is in development and may have some bugs. Please let me know if you find some.